I woke up today to a request to comment on an article I hadn’t even read yet at the time. Now, I don’t do requests, but when I saw that it was an article by my favorite nemesis Ambrose Evans-Pritchard, and I read it, I thought alright, let’s have a go. Just this once. Ambrose sings the praise of solar and natural gas in this one, and that‘s not because he’s green, the only green he likes is the color of money. And that’s just why he’s interested in solar etc. : great fortunes to be made! As is usual in his finance articles, Ambrose is great at collecting data, and far from great at interpreting them. He gets carried away by grand visions. But that, in my eyes, makes him charming too. Finance is easily dull enough that it needs its ‘color(ful) commentators’. Since Ambrose talks a lot about the demise of oil, and the risk of prices falling further, I’ll start off with a Yahoo Finance article that features Dan Dicker, who’s not so sure about those price drops. Personally, I would think too many people draw too many hasty and easy conclusions. All you need in today’s world to raise oil prices is one bomb in the wrong – or is that the right? – place, and to make that happen, I’m sure Big Oil would be more than happy to drop a Little Boy. In my view betting against oil and gas is either for big time gamblers or for people who don’t think or know enough about 1) how volatile production and delivery is at the moment, and 2) what oil really is (unique carbon structures). Dan Dicker, president of MercBloc and author of Oil’s Endless Bid, says much has changed in the past few years, other factors also explain why oil has stagnated recently: Investment banks, particularly Morgan Stanley, Goldman Sachs, and JPMorgan have not only left oil trading but have also abandoned the oil marketing business, which used to bring a steady supply of new players to the energy market. Individual oil traders (including Dicker himself) have disappeared as well. Dicker speculates around 3,000 traders have left the industry. Remaining funds are trend and algorithmic firms with long-term positions already established. The big alpha players remaining in the oil trading business are physical commodity, private firms like Glencore, Vitol, and Trifugura among others. Dicker believes these changes have all but killed immediate speculative activity, which has been good for consumers in the short term, but will be bad for the prospects of cheaper oil in the long term. Without the liquidity provided by these players in the energy market, a crude oil ‘super-spike’ could be in the cards. The demise of offshore oil drilling could also be a catalyst in Dicker’s mind, not to mention oil supplies going offline in places like Libya, and decreasing in countries like Iran and Iraq. This is leading to an upcoming oil supply crisis he says, and ultimately with liquidity not what it once was, and with the cost of oil now making it prohibitive to develop new sources, ultimately the fundamentals will have to matter again. “When you have an oil price that’s hanging around $95, you won’t see a $10 spike, you’ll see a $40 spike, because that’s what will be necessary to get these guys (oil exploration and production companies) ginned up” in order to produce more crude supply. … world energy markets are entering a period of “extreme flux”, with oil caught in triple encirclement by cheap natural gas, much more efficient vehicles and breathtaking advances in solar power as scientists crack the secrets. Gasoline demand in the OECD rich states has been sliding in absolute terms since 2007, punctuated by ups and downs, but dropping overall from 15.5m barrels a day (b/d) of crude to 14m b/d. The ‘OECD rich states’ have gotten a lot less rich since 2007, not a trivial detail. Citigroup’s report – “Energy 2020: The Revolution Will Not Be Televised” – says the average efficiency of new cars in the US has risen by 4.6 miles per gallon (mpg) since 2008 [..] Gasoline demand will slide by 900,000 b/d in the US alone by 2020. China has even more draconian curbs coming into force, with a 50mpg fuel economy mandate by 2020. Its output of electric cars is up 177% in a year, and hybrids are up 567%. India will reach 50mpg by 2021, Mexico by 2025. What those percentages mean is that they had barely any hybrids or electric cars before; these kinds of increases are meaningless. And also: a 50mpg fuel economy mandate is not what I would call draconian. This may be so, but the revolution won’t last; we already know that. If we now hastily adapt our infrastructure thinking it will, we’ll be in deep doodoo soon. More empty numbers: what this means is simply that very little capacity was added in the US in 2013. Wow, wow! Any idea what a mass exodus from the grid would mean? First, there are plenty of things you can’t run on solar. Second, you can’t just close down half the grid. You’ll have to redo and redesign the whole thing if you lose large numbers of clients. Not everything scales up in simple ways, and not everything scales down easily either. Harvard is working on an organic flow battery using quinones – from rhubarb – instead of rare earth metals. It hopes to cut battery costs by two-thirds within three years. Rivals at the University of Southern California think they can eventually slash the cost by 90% below today’s lithium-ion batteries. It is a fair bet that scientists will have conquered intermittency by the end of the decade, at which point the switch to renewables becomes a stampede. This is where great fortunes may be made, perhaps the mirror image of the wealth to be lost on fossil defaults. Brokers Sanford Bernstein call it the new order of “global energy deflation”. Technology momentum is unstoppable, and one-way only. This is where we go from fact to techno happy fantasy. And the one about ‘great fortunes’, of course. I doubt it’s a ‘fair bet’ that all problems with intermittent energy sources will be solved over the next 5 years and 4 months. What’s going to do the trick, molten salt and rhubarb? Whenever someone says things like ‘technology momentum is unstoppable’, I want to go check on my cucumbers. There’s enough hot air being sold in the shale industry, we don’t need another plot in the energy field that’s also nothing but pure financial speculation. We are never going to replace oil and gas one on one with some other miraculous source of energy, and if the reason why is not clear, there is a ton of information in the Automatic Earth archives that can explain. Oil-patronage regimes violate the loose rule that societies with a per capita income above $10,000 become more tolerant, rational and pluralist over time, so we may be doing a favour for these nations if we curb our appetite for oil. Their revolutions may, however, be televised. I never saw the ‘loose rule’ Ambrose mentions, but there can be no doubt that many regimes built on oil revenues face a very uncertain future as supplies dwindle. And as their own, often rapidly growing, populations use ever more of those resources themselves, as our friend Jeffrey Brown has explained for years in his Export Land Model. I just doubt that low global market prices will play the protagonist part in this. And now that we’re so deep into the promises of solar, why not break them down to the ground in one fell swoop, so we can all have our own two feet solidly planted on that same ground? Unless you would rather fantasize with Ambrose, but rest assured, the vast majority of it is fantasy, founded upon dreams of multi trillion dollar wealth. In my view, reality is the better option, but I can’t decide for you. The rise of the Internet means that simple factual issues can be checked quicker than would have been believed possible a generation ago. The rise of social media means that facts are not checked, they are retweeted. Such is the case with renewable energy in Germany, where it appears almost anything is to be believed. As with any myth there are multiple versions. In this case it is either that Germany gets half of its electricity or half its energy from solar panels. The latter version is easily refuted by pointing out that the majority of German energy consumption is not in the form of electricity. BMWs, Mercedes and Volkswagens run on petrol and diesel, not electricity. The more common version of the myth is debunked with simple reference to Germany’s official statistics for electricity generation. And what they tell us is quite simple. Germany does not get half of its electricity from solar panels, instead the figure is around ten times lower. Last year only 4.5% of Germany’s gross electricity generation came from solar panels, far short of 50%. 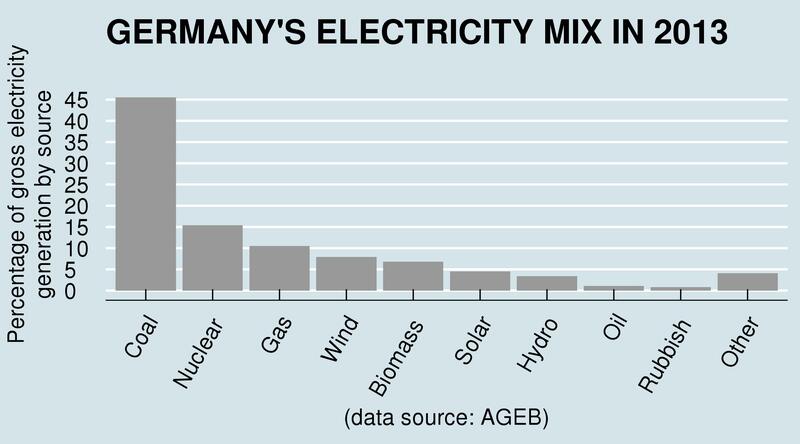 And if you want to think that half of Germany’s electricity comes from something green you will be disappointed. 46% of generation comes from coal. And just over half of coal powered electricity in Germany comes from burning lignite, perhaps the most polluting way to generate electricity on the planet. In 1990, Britain got no electricity whatsoever from gas power plants. Yet, within one decade this went from zero to forty percent. This is a much more rapid growth than has been in German solar wind, or anything else. In fact, no country has grown any source of renewable electricity at such a speed. An even more sobering comparison, given Germany’s much trumped green credentials, is with the growth of coal power plants this decade. At the end of last year Germany had a total of 36 gigawatts of installed solar capacity, and this produced 28.3 terawatt hours of electricity. However, between 2011 and 2015 Germany is opening 10.7 gigawatts of new coal power plant capacity. The consulting company Poyry projects that these new coal power plants will have average capacity factors of 80%. If so, they will have a combined average annual output of 75 terawatt hours. In other words, in five years Germany is opening coal capacity which will have an annual output of more than double that from all of its solar panels. However, this comparison is perhaps too generous. Solar panels typically last twenty to twenty five years, but coal power plants easily last twice that long. What we are seeing in Germany, then, is much more of a coal lock-in than a solar revolution. And solar power in Germany faces fundamental problems. For obvious physical reasons – the sun always sets – there is absolutely no output from solar panels a lot of the time. In the case of Germany it is around 46% of the time. However, Germany can, on a sunny day, get a lot of its electricity demand from solar panels. On the occasional sunny day solar panel output can exceed half of total electricity demand. This is the source of the myth that Germany gets half of its electricity from solar panels. Media reports on solar in Germany focus on the peak, and not on the average. The average, well, that’s one tenth of the peak, but I guess not even half of the story. [..] The new German government has put in place a long-term target of having between 2.5 and 3.5 gigawatts of solar panels installed each year. If we take the higher figure, and assume that 3.5 gigawatts is installed each year, it will take Germany almost ninety years to reach 50% solar electricity. This however is an underestimate. Solar panels must be replaced every twenty or twenty fives years, and 50% solar energy in Germany would require massive advances in energy storage techniques. Germany, then, is around a century away from getting half of its electricity from solar panels. Does this look like a revolution? Statistics for Germany’s energy consumption are available from BP and Eurostat. In total, solar energy was 2% of Germany’s primary energy consumption last year, using BP’s statistics. The precise percentage however will vary depending on how energy consumption is defined. If we used the IEA’s definition of primary energy consumption for solar, then the figure would be around 1%. I discussed the problem of measuring renewable energy consumption here. There you go. 4.5% of German electricity, and 1% of its primary energy, came from solar in 2013. Since the intermittency of solar places hard limits on its use in the central electricity grid (of about 15%), Germany is increasing its coal – no, make that lignite – capacity, which is about the opposite of solar in an environmental sense. Since Germany is hooked up to the European grid, it can rely to an extent on France’s nuclear power to balance out the intermittency issue – after it shut down its own nukes -, but that too comes with limits. It seems like we’ll all just have to wait for, and dream about, yet to be invented veggie batteries and salty power storage. Something tells me even just the dreams will take a lot of money, from the already hugely – if not fatally – indebted economies we all live in. Hoping for solutions on nation-wide scales doesn’t appear to be a wise choice. But you can do your own thing. Cut your energy use, even 90% is certainly possible. Be creative. There’s nothing wrong with solar, it’s just not a panacea for all our future troubles. We ourselves must be the solution. Look, say you live in Germany and you get an electric car. Then you’re driving on 46% lignite. Nasty stuff. And another 16% nuclear. Is that what you want? It’ll take a very long time, if it ever happens (which is very doubtful), to change those numbers significantly towards more benign sources. Why not just drive less? It’s easier, faster, and a whole lot more likely to actually make a difference. Today a man who has been involved in the financial markets for 50 years warned King World News that the coming stock market crash is going to create a human tragedy of epic proportions. John Embry, who is business partners with billionaire Eric Sprott, also discussed what is really happening in the economy. Embry: “I was in downtown Minneapolis over the weekend and I was struck by how few people were in the major stores such as Saks. But there was massive amounts of inventory and the prices were astounding. I bought a leather bag with wheels on it so I could pull it. It was listed at $599. It was then marked down to under $300, and then they gave me another 30% discount when I bought it…. “So this is just more evidence of a struggling retail environment. My experience is indicative of the true state of the economy. We get so many falsified and bogus numbers about the alleged strength of the U.S. economy. Now there are pockets of strength. I was just talking with someone about how robust things are in Texas. But the big problem is that the average citizen, who is the lead consumer in the United States, is getting seriously squeezed. That’s why they aren’t going to be able to carry the economy. And people need to remember that consumers represent 70% of the economy. So right now the price action in markets doesn’t have anything to do with reality. We’ve seen strength in the stock market this week and we have also seen renewed weakness in gold and silver. The stock market is extremely overvalued and it’s where it is because of monetary creation. They can’t allow that excess monetary creation to be exposed so they suppress the prices of gold and silver temporarily. That’s the reality as we see it today. It’s unsustainable, but for the time being they are able to maintain the illusion. The central planners, led by the United States, came up with the ingenious plan to suppress gold and silver prices back in the 1990s because there was empirical evidence that gold prices were correlated with real interest rates. That was depicted in a paper that was co-authored by Lawrence Summers in the late 1980s. Thus, a rising gold price would be accompanied by rising real interest rates based on the historical evidence. And this would be problematic in the short run for the economy and financial assets. So they came up with the scheme to suppress both gold and silver prices together because they are interrelated. And this has worked quite well for years. These depressed gold and silver prices have permitted real interest rates to be driven down to negative levels, thus permitting financial asset prices to trade at preposterously high levels. The genius turned out to be in the use of derivatives, naked shorting, and all sorts of arcane financial practices that were designed to control gold and silver prices. This has also permitted fortunes to be made by the elites in financial markets. And this has worked. You see this enormous split now between the upper 1, 2, 3%, and the rest of society. But unfortunately now we are on the cusp of the stupidity aspect of human behavior, which is what Einstein always believed to be infinite. We now have massive bubbles in stocks, bonds, and urban real estate, which are essentially the collateral for the ludicrously over-levered world financial system. But with the global economy now weakening virtually everywhere, this bubble-mania has a limited shelf life. And when it comes crashing down it’s going to create a human tragedy of epic proportions. So this is human stupidity run amok. Now as I said last week, we are not debating the ultimate outcome. Instead, we will most likely have a global hyperinflation, followed by a debt clean-out and a new world currency system. However, what can’t be ruled out is a 1930s style debt deflation starting almost immediately in the event of critical mistakes by our so-called genius leaders who believe they have everything under control. Earlier this week Bloomberg published a devastating chart showing real hourly wage growth for the first 60 months of every cycle going back to 1949. The 11 cycle average gain was 9% and the largest was 19% a half century back. Fast forward to the 60 months of ZIRP and QE since the Great Recession officially ended in June 2009, however, and you get a drastically different picture: Real hourly wages have risen by just 0.5%, and in the great scheme of things that’s a rounding error. Surely the above chart is also flat-out proof that massive money printing doesn’t work. After all, reflating wages, jobs and incomes is what the monetary politburo claims it’s all about. Indeed, the Fed has insouciantly cast a blind eye to the massive bubbles building everywhere in the financial system, and has kept money market rates relentlessly at zero for six years running on the grounds that it is not yet done “stimulating” the labor market. So why does this abysmally failed and dangerous experiment continue unabated—as Yellen will undoubtedly confirm at Jackson Hole? Self-evidently, it is irresistibly convenient to both Wall Street and Washington. The former gorges on a massive diet of carry trade gambling windfalls thanks to ZIRP and the Greenspan/Bernanke/Yellen “put”; and the latter gets a fiscal get-out-of-jail-free card owing to the Fed’s massive repression of interest rates. Indeed, with the public debt now topping $17.7 trillion, the implicit (and fraudulent) debt service relief from current ultra-low interest rates amounts to upwards of $500 billion per year. Stated differently, where there should be extreme caution on Wall Street, there is actually irrational exuberance beyond Alan Greenspan’s wildest imagination back in December 1996. And where there should be fiscal panic in Washington owing to prospective red ink of another $15 trillion over the next decade (under “un-rosy scenario”), there is unmitigated and universal complacency. Well, not for a while. The Federal Reserve is desperate to raise rates so that they can lower them again. Think about that statement for a second. By definition, every day that goes by, we are getting closer to a recession. Yes — a recession. Business cycles still exist, and recessions tend to happen when it seems like everything is good. Feel good about Draghi’s “whatever it takes” moment? Last I checked, Germany and Italy are suffering from contracting GDP, and deflaton risks are meaningfully rising in Europe. In the U.S., the Fed needs to raise rates to have ammunition to fight the next recession, which for all we know, may be coming much sooner than we think as global growth continues to be questioned, and disinflationary forces continue to permeate worldwide. Of course, it remains to be seen if the Fed can possibly do this when inflation remains muted. There are some that are arguing that another round of quantiative easing is coming. The Fed isn’t done with bond buying because we are in the “QE4EVA” period. I disagree. I think the Fed may never do quantitative easing again. Why? Because if they do, then Yellen would be admitting that the Fed has turned Japanese, and the last thing the Fed wants is to lose credibility by being perceived as a different shade of the Bank of Japan that can never leave the marketplace Deflation is a real problem, and is decades in the making for developed economies. Remember — the problem for all central banks has never been the amount of money in the system. It was, is, and continues to be the usage of money throughout the system. The velocity of money simply isn’t turning in a way that suggests reflation is coming. If anything, the velocity of money has completely crashed despite all kinds of stimulus. I believe this means one thing and one thing only: Risk management will likely return with a vengeance on the realization that we are entering a dangerous phase of future economic growth and inflation expectations worldwide. People forget that, mathematically, what matters for longer-term wealth creation is not getting big upside gains, but avoiding big downside losses. Note that the velocity of money peaked some time around the mid 1990s — this is not a trend that happened after the 2008 financial crisis. This is something deeper, and I think another round of QE won’t help, won’t matter, and won’t reverse this trend. So what if the S&P 500 drops 20% in a correction? The Fed may not be able to do anything about it given that all of their tools have failed to actually increase reflationary pressure. This might be referred to as “End-of the-Cycle Mispricing, but, what a cycle! End-of-the-Cycle Mispricing discussed the derangement of prices, in all assets. Money managers as a whole have not considered protection for their funds when everyone runs for the door at once. The “catastrophic bond” paper linked to the discussion was specific, but, there are plenty of avenues to construct such protection. What follows is a transcription of just how ignorant, moreover, willingly ignorant, and, it may be, enthusiastically ignorant, was the Bernanke Fed when it decided that holding interest rates at zero% would be its policy. Before plunging through the looking glass, here is the conclusion: If ever there was a time to protect one’s assets from further FOMC derangement, this is it. If you do not (and cannot) design a Personal Protection Plan, buy cash, gold nuggets, and silver eagles. Reading the transcript from the December 15-16, 2008, FOMC meeting, it is clear the Federal Open Market Committee was embarking on its zero-interest rate policy (ZIRP – which is still all we’ve got) as an experiment. By way of background, the FOMC had cut the Fed funds rate cut from 5.25% on June 29, 2006 to 1.00% on October 29, 2014. Most of reduction had been over the previous few months as the pillars fell: Bear Stearns, Merrill Lynch, Lehman Brothers, Goldman Sachs, and Morgan Stanley. The last two converted to commercial banks and received government protection as well as deposit-taking authorization. The December meeting addressed whether the funds rate should be cut to zero (ZIRP), or, to some halfway house. As has been true throughout Bernanke’s chairmanship, the 284-page debate could only have been held in the Eccles Building. The funds rate had been trading below the declared rate for a couple of months. One can only imagine the ecstasy at the Fed on December 12, 2008, when the funds rate traded at 0.00%: the “zero-bound.” This had been Professor Bernanke’s ad pitch since the early 1990s. At his Aug. 13 press conference to present the Bank of England’s quarterly inflation report, Governor Mark Carney sashayed around a direct question asking whether an early interest-rate increase might be a helpful way to ensure borrowing costs rise only slowly and gradually. Minutes of the central bank’s most recent policy meeting, released today, suggest his discomfort was warranted — and that an increase is likely even before wages start to grow. Two of the nine Monetary Policy Committee members voted to raise the benchmark rate from its record low 0.5% when they met Aug. 6-7. It’s the first crack in the consensus since July 2011. Federal Reserve officials raised the possibility they might raise rates sooner than anticipated, as they neared agreement on an exit strategy, according to minutes of their July meeting. “Many participants noted that if convergence toward the committee’s objectives occurred more quickly than expected, it might become appropriate to begin removing monetary policy accommodation sooner than they currently anticipated,” the minutes, released today in Washington, read. Fed Chair Janet Yellen has committed to use monetary policy to strengthen the labor market so long as inflation remains in check. “Many participants” at the meeting still also saw “a larger gap between current labor market conditions and those consistent with their assessments of normal levels of labor utilization,” the minutes showed. The release of the minutes set the stage for Yellen’s speech on labor markets Aug. 22 at the Kansas City Fed’s annual symposium in Jackson Hole, Wyoming. She has focused on low labor-force participation, weak wage growth and elevated levels of long-term unemployment to emphasize continued slack. “She’s going to make the case that while some data points are better, universally all the data points aren’t strong, and because we’re not seeing a surge in inflation that gives the Fed a little more leeway to be cautious,” Phil Orlando, chief equity strategist at Pittsburgh-based Federated Investors Inc., said in an interview. More Ambrose equals more Keynes. An array of Nobel economists have launched a blistering attack on the eurozone’s economic strategy, warning that contractionary policies risk years of depression and a fresh eruption of the debt crisis. “Historians are going to tar and feather Europe’s central bankers,” said Professor Peter Diamond, the world’s leading expert on unemployment. “Young people in Spain and Italy who hit the job market in this recession are going to be affected for decades. It is a terrible outcome, and it is surprising how little uproar there has been over policies that are so stunningly destructive,” he told The Telegraph at a gathering of Nobel laureates at Lake Constance. “It could be avoided with better use of stimulus, and spending on infrastructure. That would boost growth and helped the debt to GDP ratio,” Mr Diamond said, echoing a widely-heard critique among the Nobel elites that Europe’s policies have been self-defeating. Professor Joseph Stiglitz said austerity policies had been a “disastrous failure” and are directly responsible for the failed recovery over the first half of this year, with Italy falling into a triple-dip recession, France registering zero growth and even Germany contracting in the second quarter. “There is a risk of a depression lasting years, leaving even Japan’s Lost Decade in the shade. The eurozone economy is 20pc below its trend growth rate,” he said. Mr Stiglitz said the eurozone authorities had massively underestimated the contractionary effects of austerity and continue to persist in error despite claims that the crisis is over. “I am very concerned about the future of monetary union, and they haven’t yet felt the impact of geopolitical tensions.” He said the eurozone needs joint debt issuance to repair the structural flaws of EMU, but almost no progress has been made. “Europe suffers from fatal politics,” he said. Angela Merkel has delivered a sharp rebuke to Italy and France for hindering the eurozone’s recovery by breaking longstanding fiscal rules. The German chancellor, under pressure following a fall in GDP in the second quarter, said faltering growth was the direct result of the 18-member currency zone’s inability to punish those countries that ran high deficits in contravention of limits set by Brussels. She said Germany had shown it was possible to cut the government’s annual spending deficit while at the same time improve the economic situation. Speaking to an audience of Nobel prize-winning economists in the Bavarian town of Lindau, she said individual countries had ignored Brussels and the European Central Bank (ECB) to continue running larger deficits than allowed by the fiscal rules. “We have very little, if any, possibility of sanctioning those countries that break the rules,” she said. Her comments echoed those of ECB president Mario Draghi, who last month warned that without moves to strengthen the fiscal pact and impose punishments on rule-breaking countries, the eurozone project could flounder. The two speeches highlight the growing frustration among senior eurozone policymakers at the failure of France and Italy to meet the 3% deficit target set by Brussels with Germany’s support. The eurozone economy stalled in the last quarter following poor output figures from France and Italy and a slowdown in Germany, much of it blamed on a drop in demand for German goods from its largest neighbours and the Ukraine crisis. However, critics of Merkel and her finance minister Wolfgang Schaeuble, argue that Germany is the source of the currency zone’s problems following its pursuit of balanced budgets while harder-hit countries have yet to rebuild their banking sectors and bolster consumer confidence. Euro-area manufacturing and services activity slowed in August, signaling that the economy of the 18-nation region remains vulnerable to weak inflation and rising tensions with Russia. A Purchasing Managers Index for both industries fell to 52.8 from 53.8 in July, London-based Markit Economics said today. A reading exceeding 50 indicates expansion. Economists predicted a decline to 53.4, according to the median of 20 estimates in a Bloomberg News survey. While the gauge has signaled growth for more than a year, economic expansion in the euro area unexpectedly halted in the second quarter amid weakness in the region’s three largest economies. With inflation below 1% since October, unemployment near record highs and rising political tensions, the European Central Bank unveiled a stimulus package in June that policy makers say will take months to show results. “If there was a risk of a strong impact from the Russia-Ukraine crisis, this data can be taken as a sign of resilience of the euro-area economy,” said Chiara Corsa, an economist with UniCredit SpA in Milan. Still, data signal “that the slowdown in global trade is hurting growth. This should ring an alarm bell for the outlook in the third quarter,” she said. Let’s do some quick math. Real, inflation-adjusted, Gross Domestic Product (GDP) for the first quarter of 2014 was -2.13% annualized after being revised slightly higher from -2.96%. The first estimate of the second quarter’s economic growth was 3.89% annualized. If we average the two together, the first half of 2014 is currently sporting an annualized growth rate of 0.88%. Got it? Here is my point. In order for real economic growth to hit the current target of 2.4% annualized for the entire year, the final two-quarters of 2014 must hit a minimum growth rate of 3.92%. The chart below shows the history of quarterly annual growth rates of the economy since 2006. While on the surface the US economy has been chugging along from GDP-crashing “snow in the winter” to GDP-cratering “warmer|cooler than expected weather in the spring|summer|fall”, with bouts of GDP-boosting inventory accumulation inbetween, in recent months two very disturbing trends about that all important dynamo behind the economy, the US consumer, have emerged. On one hand we wrote three weeks ago that a “shocking” 77 million, or one third, of Americans face debt collectiors: a statistic which crushes any suggestion that US household credit is substantially improving based on trends in 30, 60, or 90-day delinquency, as it means that the real pain is not at the near-end of the default/delinquency timetable, but the far end, which incidentally has just as dire an impact on one’s credit score as a plain vanilla default (and explains why none other than Fair Issac has jumped in to “adjust” its credit methodology to artificially boost FICO scores of these millions of Americans). On the other hand, we have been closely following the ongoing deterioration of the car subprime loan bubble: something that both Bloomberg and the Fed have both also been paying close attention to recently, yet a bubble which nobody wants to burst, because as we wrote several days ago, it is none other than the subprime car loan bubble that allowed car production to surge the most last month since Obama’s Cash for Clunkers capital misallocation program, in the process lifting overall manufacturing and Industrial Production, and thus GDP. Earlier today Experian released its latest, Q2, metrics that tie these two very worrying trends together, namely the trend in delinquencies, defaults and repossessions. As NBC summarizes: “The repo man is getting very busy as a growing number of car and truck owners are struggling to make their monthly auto loan payments. Experian, which analyses millions of auto loans, said Wednesday that the%age of those loans that were delinquent or ended up in default with the vehicle being repossessed surged in the second quarter of this year.” Hyperbole? Hardly. In fact, the auto loan subprime bubble may be the latest to burst (after student loans) as the rate of car repossessions jumped 70.2% in the second quarter, with much of that increase coming from finance companies not run by automakers, banks or credit unions. The good news: the%age of auto loans that end in default is just 0.62% of all auto loans. However, as everyone but the Fed knows, what matters is the flow, not the stock, and the direction and acceleration in defaults simply means that the maximum saturation point has been reached and going forward lenders will experience ever greater losses, which in turn will limit their willingness to offer subprime loans to US consumers desperate to find a house (because clearly one doesn’t need to home when one can sleep in their Chevy Tahoe). One of many bad numbers from China. China’s services sector growth has slowed, largely due to persisting weakness in the property market. The results of a survey, compiled by HSBC and Markit, showed that China’s services purchasing managers’ index (PMI) plummeted to a near nine-year low of 50.0 in July from a 15-month high of 53.1 in June. Meanwhile, a government-compiled services PMI for the non-manufacturing sector has eased to a six-month low of 54.2 in July from 55 in June, logging its weakest reading since January. A reading above the 50 threshold demarcates expanding activity from a contraction. Hongbin Qu, Chief Economist, China & Co-Head of Asian Economic Research at HSBC said: “…Both the new business and outstanding business indices declined from their levels in June. “The weakness in the headline number likely reflects the impact of the ongoing property slowdown in many cities as property related activity, such as agencies and residential services, see less business. Meanwhile, the employment and business sentiment indices remain stable. In the coming months, we think the service sector may get some support from the recovery in investment. “But today’s data points to the need of continued policy support to offset the drag from the property correction and consolidate the economic recovery,” Hongbin added. The US Department of Justice is poised to announce a record $16bn-$17bn settlement with Bank of America over allegations it misled buyers of mortgage-backed securities that proved to be packaged with faulty loans. The record settlement, expected to be announced on Thursday, would be the largest arising from the subprime crisis, and one of the largest ever to be agreed in corporate America. US prosecutors are also preparing a civil lawsuit against Angelo Mozilo, co-founder of Countrywide Financial, in a final effort to target the figure most associated with the subprime mortgage boom which preceded the financial crisis. The US attorney’s office in Los Angeles is working on the case and plans charges against several other former Countrywide executives, according to a person familiar with the matter. The pursuit of Mr Mozilo, first reported by Bloomberg News, could result in a suit being filed in the coming weeks. “We do not comment on rumours concerning any investigation. There is no sound basis, in law or fact, for the government to bring a claim against Mr Mozilo,” said David Siegel, a lawyer for the Countrywide co-founder. He added that his client “stands virtually alone among banking and mortgage executives to actually have been pursued by this government and already paid a record penalty in settlement”. BofA acquired Countrywide in 2008 in a $4bn deal that is widely considered to be one of the worst corporate acquisitions of all time, costing the bank billions of dollars in subsequent losses and litigation. To think that guy’s been out of prison all those years. Countrywide Financial Corp. co-founder Angelo Mozilo hasn’t entirely escaped prosecutors’ wrath for his company’s risky lending. A U.S. government task force wielding an innovative legal strategy plans to bring a civil case against him over the excesses of the subprime-mortgage boom. The last-ditch effort comes three years after the Justice Department abandoned a criminal probe of Mozilo. In 2012, public anger over the lack of prosecutions stemming from the financial crisis spurred the Obama administration to create a team devoted to investigating fraud in mortgage-backed securities. The group has wrestled at least $20 billion from Wall Street banks using a law with a relatively low threshold for suing and a long period to bring cases. Relying on the same anti-fraud law, the Financial Institutions Reform, Recovery and Enforcement Act, the U.S. attorney’s office in Los Angeles is preparing to sue Mozilo and as many as 10 other former Countrywide employees, according to two people with knowledge of the matter. The case may be helped along by an imminent U.S. settlement with Bank of America, which acquired Countrywide in 2008. That resolution may come as soon as today with Bank of America expected to pay as much as $17 billion and to acknowledge improper mortgage practices at Countrywide. U.S. prosecutors dropped a criminal probe of Mozilo in early 2011, a person with knowledge of the matter said at the time. The Citizens for Responsibility and Ethics in Washington, a watchdog group, sued the Justice Department in June to try to obtain its records detailing investigations of Mozilo and Countrywide. The group faulted the government for failing to prosecute either Mozilo or the company “despite substantial evidence of wrongdoing.” Mozilo agreed to settle the SEC case in October 2010 by paying a $22.5 million fine and disgorging $45 million of gains from stock sales at what the regulator said were inflated prices. Bank of America covered a portion of his penalties. There may be little point battling icebergs to drill in the Arctic, or in trying to extract oil from the ultra-deepwater fields in the mid-Atlantic, beneath layers of salt, three kilometres into the Earth. The props beneath the global oil industry are slowly decaying. The big traded energy companies resemble the telecom giants of the late 1990s, heavily leveraged to a business model already threatened by fast-moving technology. Citigroup warns – or cheerfully acclaims, depending on your point of view – that world energy markets are entering a period of “extreme flux”, with oil caught in triple encirclement by cheap natural gas, much more efficient vehicles and breathtaking advances in solar power as scientists crack the secrets. The combined effect is to “bend” to the curve of global oil use over coming years, eroding the assumptions that have underpinned a threefold rise in Western oil industry debt to $600bn since 2005, much of it to hunt for crude in prohibitively expensive places. Costs rose 9% in 2012 and 11% last year, according to the US Energy Department. There may be little point battling icebergs to drill in the Arctic, or in trying to extract oil from the ultra-deepwater fields in the mid-Atlantic, beneath layers of salt, three kilometres into the Earth. The “oil intensity” of global GDP has already halved since 1980s. We are becoming more frugal. Gasoline demand in the OECD rich states has been sliding in absolute terms since 2007, punctuated by ups and downs, but dropping overall from 15.5m barrels a day (b/d) of crude to 14m b/d. Another bad day for traders bullish on energy as WTI crude oil slid 2%, hitting its lowest level since January. Across the pond Brent crude traded at its lowest level in almost 14 months. From the heady days of mid-2008 when it traded at nearly $150 a barrel, crude oil has had quite a rocky ride. After sliding down to the $30s and rallying back around $120, crude has settled in around the $90 to $110 range for the past two years. Commodity traders and analysts have wondered why oil hasn’t gone higher. Geopolitical tensions abound across the world; the Middle East seemingly hasn’t been this unstable in years. In fact, some believe the commodity could actually go lower. Blake Morrow posits that with North American production rising, vehicles becoming more efficient, and crude oil’s inability to rally with global equities, all signs point to a bearish future for oil. Dan Dicker, president of MercBloc and author of Oil’s Endless Bid says much has changed in the past few years, other factors also explain why oil has stagnated recently: Investment banks, particularly Morgan Stanley, Goldman Sachs, and JPMorgan have not only left oil trading but have also abandoned the oil marketing business, which used to bring a steady supply of new players to the energy market. Individual oil traders (including Dicker himself) have disappeared as well. Dicker speculates around 3,000 traders have left the industry. Remaining funds are trend and algorithmic firms with long-term positions already established. The big alpha players remaining in the oil trading business are physical commodity, private firms like Glencore, Vitol, and Trifugura among others. Dicker believes these changes have all but killed immediate speculative activity, which has been good for consumers in the short term, but will be bad for the prospects of cheaper oil in the long term. 1) Coal is currently used to meet 30% of global primary energy needs, which is the highest level since 1970. It is used to generate 41% of the world’s electricity and is used in the production of 70% of the world’s steel. 2) According to the World Resources Institute, almost 1,200 coal-fired power plants had been proposed globally in 2012, with China and Pakistan accounting for the majority of these projects. 3) Japan, a country with no natural energy resources to speak of, invested $19.7 billion in overseas coal projects in the last seven years according to the NRDC. Germany’s state development bank, KfW, followed a similar path, lending $3.7 billion in the last eight years to coal projects in Greece, India, Serbia, South Africa and Australia. 4) As the chart below from the IEA illustrates, international trade in coal is hardly on the wane. Coal exports totaled 1,300 million tonnes last year. The top five coal importers are China, Japan, India, Korea, and Chinese Taipei (note: all in Asia), while the top five exporters are Indonesia, Australia, Russia, the US and Colombia). 5) Recent research states as much as one fifth of global exports lose money at $72 a ton. 6) Over 2,000 smaller mines in China are expected to close by 2015, as a growing share of coal production is uneconomic. According to data from the National Bureau of Statistics, output in China – the world’s biggest producer – rose to 3.68 billion tons in 2013, up from 3.65 billion the previous year. 7) Beijing is banning coal use in six main districts of Beijing by 2020 in an effort to combat air pollution. It will stop the use of coal and coal products and shut down all coal-fired power plants and other coal facilities. Coal accounts for approximately one quarter of the city’s total energy consumption. 8) US coal consumption is expected to grow by 2.5% to 949 million short tons this year, according to the EIA, due to its relative attractiveness in the face of higher year-over-year natural gas prices. It is expected to drop by 2.7% in 2015, however, due to coal plant retirements (h/t the MATS ruling from the EPA). 9) US coal production is expected to grow 2.5% this year, according to the EIA, due to aforementioned higher consumption, as well as a need to replenish inventories. 10) Over 60% of Africa lacks access to electricity (aka over 600 million people). The EIA projects Africa to increase its coal consumption by 70% by 2040. It has 35 billion tons of recoverable coal reserves, but as the BP statistical review highlights, comparatively low levels of both production and consumption compared with other regions of the world. Ice loss contributes 1 centimeter (0.4 inch) per decade to sea level rise, and this rate has doubled since 2009. A new assessment from Europe’s CryoSat spacecraft shows Greenland to be losing about 375 cu km of ice each year. Added to the discharges coming from Antarctica, it means Earth’s two big ice sheets are now dumping roughly 500 cu km of ice in the oceans annually. “The contribution of both ice sheets together to sea level rise has doubled since 2009,” said Angelika Humbert from Germany’s Alfred Wegener Institute. “To us, that’s an incredible number,” she told BBC News. In its report to The Cryosphere journal, the AWI team does not actually calculate a sea-level rise equivalent number, but if this volume is considered to be all ice (a small part will be snow) then the contribution is likely to be on the order of just over a millimetre per year. This is the latest study to use the precision altimetry data being gathered by the European Space Agency’s CryoSat platform. The satellite was launched in 2010 with a sophisticated radar instrument specifically designed to measure the shape of the polar ice sheets. The AWI group, led by senior researcher Veit Helm, has taken just over two years’ worth of data centred on 2012/2013 to build what are called digital elevation models (DEMs) of Greenland and Antarctica, and to asses their evolution. These models incorporate a total of 14 million individual height measurements for Greenland and another 200 million for Antarctica. When compared with similar data-sets assembled by the US space agency’s IceSat mission between 2003 and 2009, the scientists are able then to calculate changes in ice volume beyond just the CryoSat snapshot. China buys ivory. That’s why this happens. How hard is it to say the buck stops here? The illegal trade in elephant tusks has soared in recent years, and a kilogram of ivory is now worth thousands of dollars. Much of the demand has been driven by a rapidly growing market in Asia. If this is sustained, then we will see significant declines over time.” While conservationists have long said the outlook was bleak, this study provides a detailed assessment of the impact this is having on Africa’s elephants. The researchers have found that between 2010 and 2013, Africa lost an average of 7% of its entire elephant population each year. Because elephant births boost the population by about 5% annually, this means that overall more of the animals are being killed than are being born. 8000 earthquakes in 2 weeks. Iceland’s authorities have evacuated an area close to the country’s Bardarbunga volcano over fears it could erupt. The area, which is more than 300km (190 miles) from the capital Reykjavik, has no permanent residents but sits within a national park popular with tourists. The move came as geologists said about 300 earthquakes had been detected in the area since midnight on Tuesday. Iceland’s Eyjafjallajokull volcano erupted in 2010, producing an ash cloud that severely disrupted air travel. The national civil protection agency said the decision to evacuate more than 300 people close to Bardarbunga was a “precautionary” safety measure. “It cannot be ruled out that the seismic activity in Bardarbunga could lead to a volcanic eruption,” it added. On Monday, Iceland’s meteorological office raised its assessment of the risk level to the aviation industry from yellow to orange. The orange alert, the fourth level on a five-grade scale, indicates that a volcano is showing “escalating unrest with increased potential of eruption”. The Bardarbunga volcanic system is located under the north-west region of Iceland’s Vatnajokull glacier. Authorities say any eruption in the volcano, which sits under an ice cap, could result in flooding of the area north of the glacier. The volcano was said to be stable on Wednesday but scientists warned that it is big enough to disrupt air traffic over the Atlantic if an eruption does occur. The Eyjafjallajokull eruption in April 2010 caused the largest closure of European airspace since World War Two, with losses estimated at between 1.5bn and 2.5bn euros (£1.3-2.2bn).